Yep, you read that title correctly. VOLCANO exploring. Okay, I probably should’ve mentioned that it’s a dormant volcano but still, that sounds pretty insane right!? If I’m being honest though, I couldn’t think through the reality of driving up a massive rock form being filled with molten lava too much or I probably would’ve psyched myself out. My husband, Bryan, and I first visited Haleakalā National Park earlier this year and when we found ourselves in Maui again this Fall, I knew we had to go back! Many will agree that one of the most stunning sunrises in the world can be seen from the summit… not that we would know because we’ve literally woken up for 3 sunrises in our lives, but luckily for us, sunset is absolutely GORGEOUS as well! Thanks to Backcountry.com, I was able to find the supplies I needed for this day of adventure all in one place! Backcountry is the perfect one-stop-shop for all things outdoors. I was able to find high-quality clothing, accessories, and my travel necessities from some of my absolute favorite brands. The options are endless, which at times can be a little overwhelming. That’s why Backcountry’s Gearhead program is amazing! Gearheads are the ultimate outdoor experts and are available over the phone or online to give you expert advice on the gear you need. It’s free of charge and will save you so much more time while planning your next adventure! We began our drive on the west side of the island where the temperature is very warm. Since I would be spending the next hour and a half in the car, comfort and functionality in my attire was vital to me. I chose a sports bra & high-rise leggings both from The North Face. I absolutely love styling activewear that is both cute, functional, and super comfortable and these pieces are just that. The sports bra is super strappy and supportive and the leggings are a beautiful gray wash and have not one, not two.. a whopping FOUR pockets. Functionality at it’s finest! We made several stops along the drive up to scope out the spectacular views. I can honestly say that this is one of my favorite drives I’ve ever taken. Every moment was just beautiful, but seeing the weather in the distance disheartened us a bit. Because of the cloud cover, it was highly likely we’d run into some rain and probably wouldn’t be able to see the view of the island during sunset. We debated whether to turn back but in the end, we decided to adventure on! After our experience visiting the crater over the summer, I knew that the weather at the summit is usually 30 to 50 degrees cooler than the rest of the island and that the weather can be quite unpredictable and change very sporadically. I knew it was important to pack some light layers so that I could bundle up when necessary! Nobody is more miserable than this girl when she’s cold. Trust me. Because I’m the girl who packs enough clothing for a week when I’m going on an overnight trip, a hefty bag to pack my essentials was absolutely necessary. I brought along my Fjallraven Travel Backpack and boy was I grateful to have it. This backpack is the epitome of perfection when it comes to travel. It’s perfect for carrying on a plane, a weekend getaway, or in this case, an all day trip! I was able to pack my fleece jacket from the The North Face and my Backcountry beanie with ease in the interior pockets, as well as my wallet, laptop, headphones, chapstick, water, some snacks, sunscreen… literally anything I could possibly need! This backpack has so many pockets that I don’t even know what to do with all of them which is amazing! I also love that the straps can be stowed, so you can carry it like a suitcase as well. Bryan was pretty envious of this particular bag so I may be purchasing another! Once we had almost reached the summit, it was clear that we would not be seeing that beautiful view of island. Instead, we had lots of rain and fog. Being from Southern Arizona, these are elements that we seldom see, so we were actually pretty excited! It was time to pull out my Osito 2 Fleece Jacket from The North Face. This jacket is so on trend right now with the cozy faux fur and incredibly functional with the outer zip pockets and two inner pockets as well! It’s lightweight and very easy to pack, but also keeps you so warm. I also put on my Backcountry Marled Beanie which is so soft and kept my head and ears dry through the duration of the rainfall. When we finally reached the summit, we were SO excited. Haleakalā’s summit legit looks like Mars.. not that I’ve been there, but it looks like what I would imagine Mars to look like with the black and red rocks and the low hanging clouds. It is definitely other-worldly! My Backcountry gear made it so easy and comfortable to hike around the summit, even with the somewhat dreary weather. We were also really excited to get a little peek of blue skies at the top! 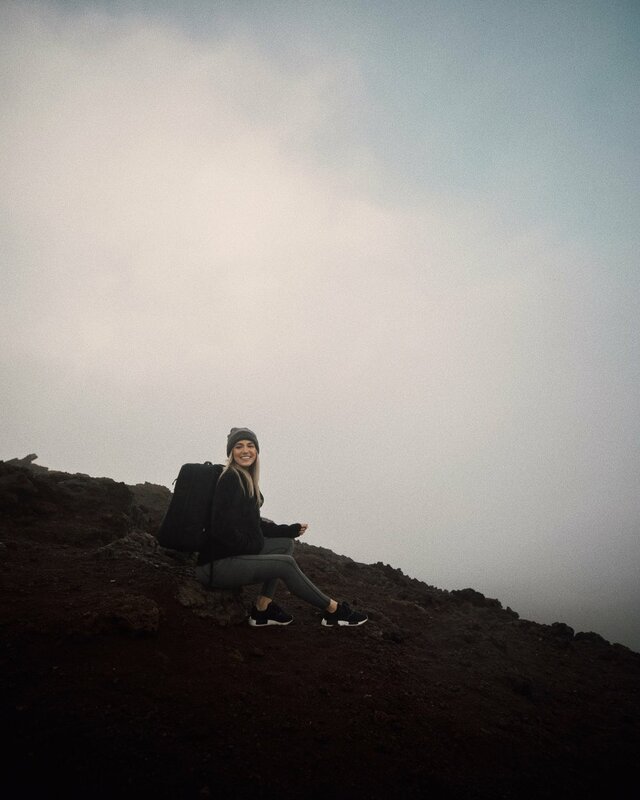 Although the weather was not optimal, I am still so grateful for this trek to Haleakalā National Park with my favorite adventure buddy. Being prepared with the perfect gear from Backcountry.com is really what saved the day! Backcountry is also giving 15% off to my followers! Be sure to shop my look below, use my code ALI15 for 15% off, and comment some of your favorite layering pieces for fall!